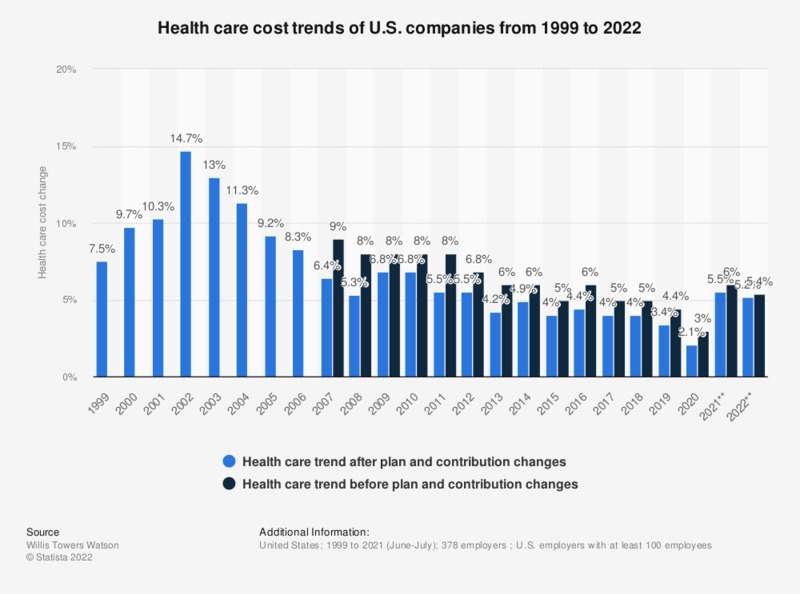 This survey represents US company's health care cost trends from 1999 to 2019. In 2004, the health costs of U.S. employers for employees after plan and contribution changes increased some 11.3 percent. A company’s medical benefit expenses for insured plans include the premium paid by the company. For a self-insured plan, these expenses include all medical and drug claims paid by the plan, company contributions to medical accounts (FSA/HRA/HSA) and costs of administration minus employee premium contributions. The annual change in costs is based on costs for active employees after plan and contribution changes. Respondents are asked to report trends directly in the survey.